1. You must be 21 or over. 3. You must be able to remember that you have something to do for 45 minutes on Saturday evenings. That is it. Now I know Durgan couldn’t fill all the crazy logistical requirements, but I’m sure someone out there can. 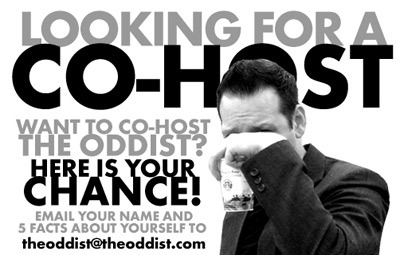 So email TheOddist@theoddist.com with your name and 5 facts about yourself. I’ll respond to everyone and the best four will get to host a show. What are you waiting for…DO IT!